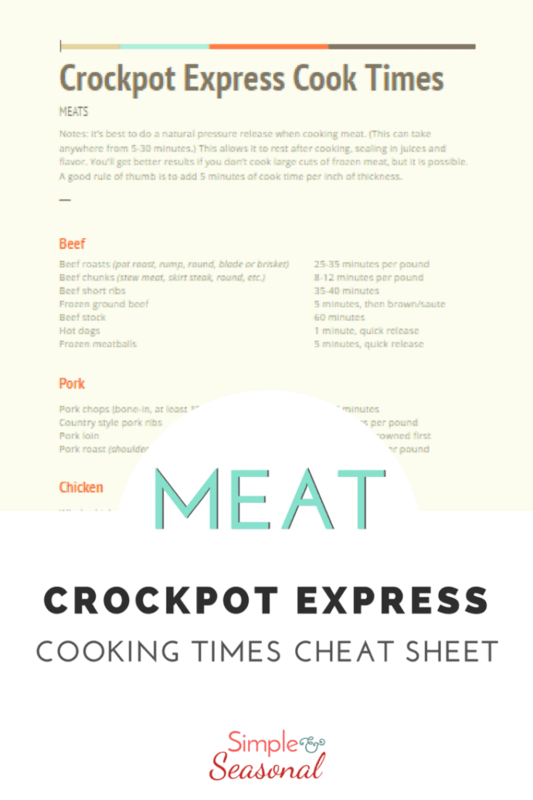 Download a free printable PDF listing general Crockpot Express Cooking Times guidelines for commonly served meats like beef, chicken and pork. Print it out and hang it up in your kitchen for easy reference! The number one question I get from people in my Crockpot Express Community on Facebook and other groups is how long do I cook____for? The problem is, there’s no easy answer! There are so many variables when it comes to pressure cooking that it requires a lot of trial and error. I spent a lot of time researching online, reading cookbooks, downloading user manuals and polling other users. 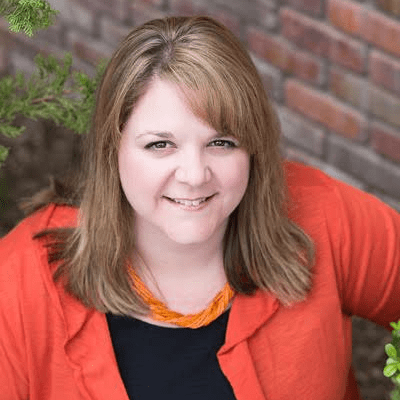 Then I created this Crockpot Express Cooking Times cheat sheet as a general guide to help you know where to start when cooking meats. This is the pressure cooker (technically, multi-cooker) that I have. The Crockpot Express only comes in the 6 quart size, so if you are using a larger pressure cooker, the times may need to be adjusted a bit. If you’re new to pressure cooking (or cooking in general) it might be easier to modify an existing pressure cooking recipe than to start from scratch. I’m constantly adding new Crockpot Express Recipes to my collection here. Even if the recipes aren’t exactly what you’re looking for, you can probably find similar ingredients to match your own and use these recipes as a guide for cooking time and amount of liquid needed. A good rule of thumb for meat is to think of how long it would take to cook in the oven or on the stove, and then reduce that time by 50-75 percent. So for example, if you would normally cook a roast for 3 hours, start with 1 hour in the Crockpot Express and then check the temperature. You can add more if needed. Be sure to record your cooking times when you first get started, as everyone’s preferences can be different! It’s OK to play around with times until you find what you like. Just be sure to heat everything to a safe temperature at least! Sometimes you are just looking for a basic idea of how long to cook something and you don’t need a fancy recipe to go along with it. 🙂 That’s why I created this Crockpot Express Cooking Times guide. There’s enough empty space on the paper to make notes and record what worked best for you. Good luck! Fill out the box below to get the instant download! Looking for some good accessories to use with your Crockpot Express? See my favorite Crockpot Express Accessories here. Uh-oh! 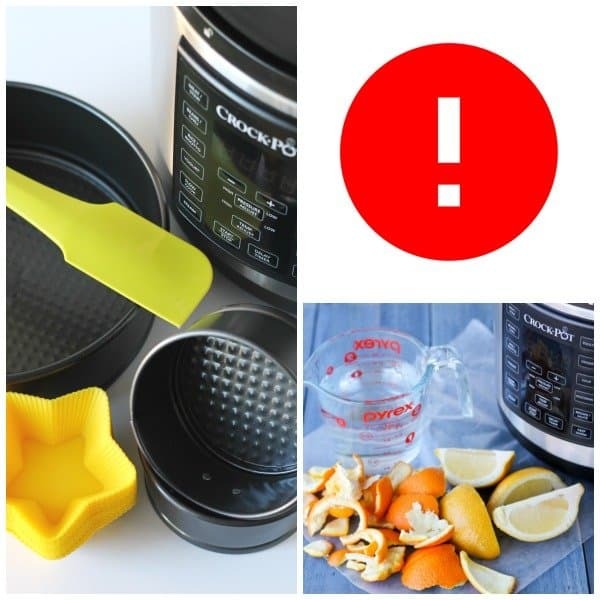 Did the dreaded E6 error code pop up while you were cooking? See what is it and how to fix E6 errors here. Great video! Wasn’t long before I realized the odor from the lid. I soak it in a little baking soda for about an hour and wash the inside pot also. I Seldom CPE but am looking for ideas 2night. Do you have a good wings recipe ? Sorry about that! There were some technical difficulties. You should be able to add yourself to the list now using the box in the post. Once you add your email address, the printable will be delivered to you immediately. 🙂 Thanks so much!